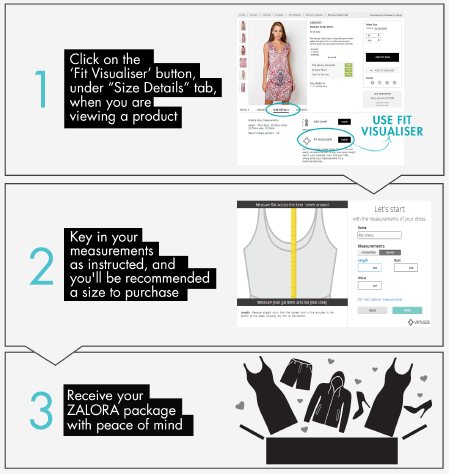 Fit Visualiser is a virtual fitting solution aimed to help you find the perfect size and fit when shopping online at ZALORA! Fit Visualiser lets you compare the measurements of the garment you want to buy with the measurements of the garment you have at home. This is done by overlaying graphic silhouettes of the two. I don't have a measuring tape. How else can I use Fit Visualiser on ZALORA? 1. 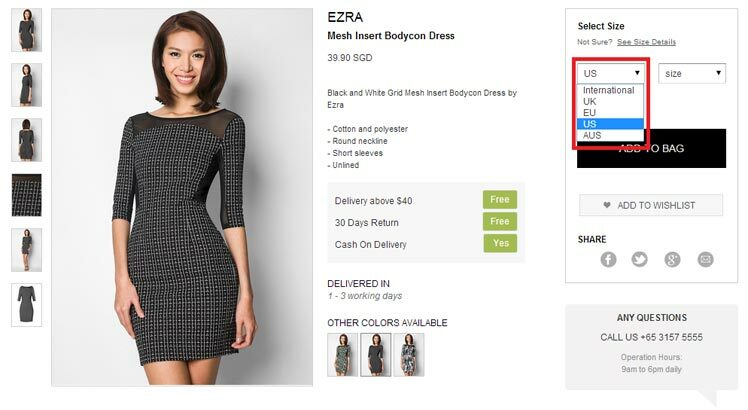 Browse a garment you already own from ZALORA. Click on the "Size Details" tab on the product page and click on the "Fit Visualiser" button. 2. Fit Visualiser's window pops up. 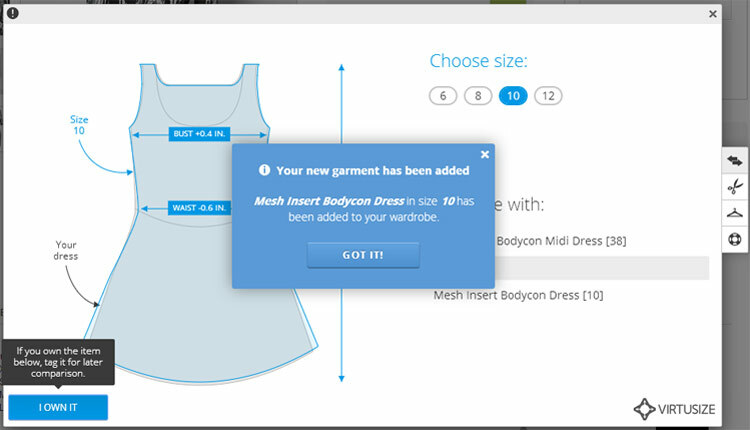 Click on the "I OWN IT" button on the bottom left hand corner to add to your Fit Visualiser wardrobe. 3. The garment now is a reference item in your Fit Visualiser wardrobe. Now you could browse other garments installed with Fit Visualiser and see how they compare with the fit and size of your reference item. What is the difference between the blue and the grey silhouettes shown on the Fit Visualiser pop up window? The grey silhouette is your garment and the blue silhouette is the garment you are curious about. You can try and gauge the fit of different sizes by flipping between the size-buttons in the top right corner. Does a difference of one inch/cm mean that the garment won’t fit me? Probably not. In most cases, one inch is insignificant. But some measurements are more sensitive than others. For example, a difference of one inch on a sleeve or an inseam would probably affect the fit, while elsewhere it wouldn't be as noticeable. Why does my garment look so strange? If your garment looks strange, you may have entered incorrect measurements. Make sure that you have not measured your body, but measured a garment laid flat. Also, double-check that sleeve measurements start from the back of the collar. Why does my garment look so large/small? 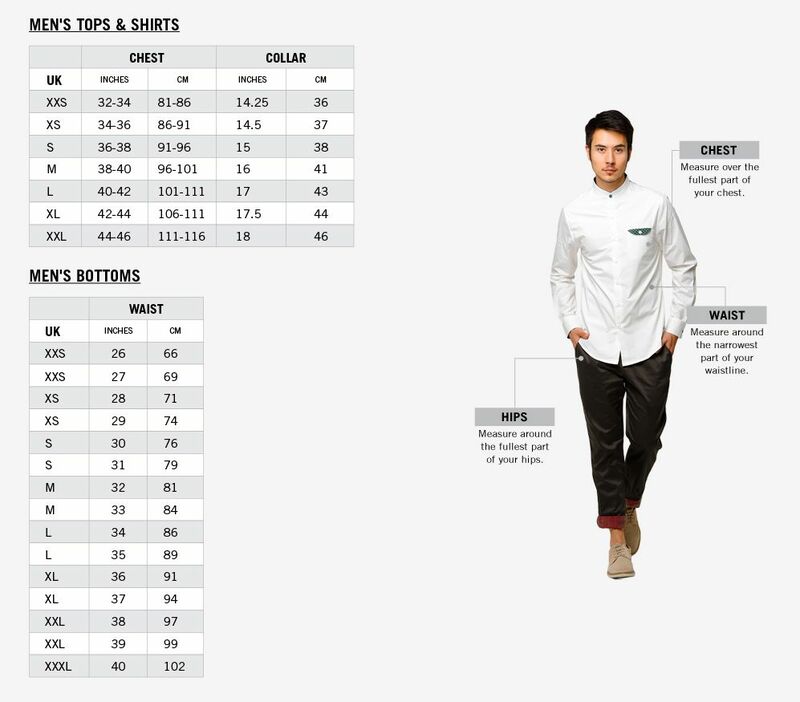 Unexpected size variations can result from comparisons of garments that are made of different fabric types. For instance, if one garment is made with stretch fabric and the other isn’t, they’ll look very different next to each other. We're working on getting as many clothing items installed with Fit Visualiser as possible! Should you have any questions regarding the use of the measuring tool, please feel free to get in touch with our friendly Customer Experience Team here, or drop us a call at +65 3157 5555, 9am - 7pm, daily.